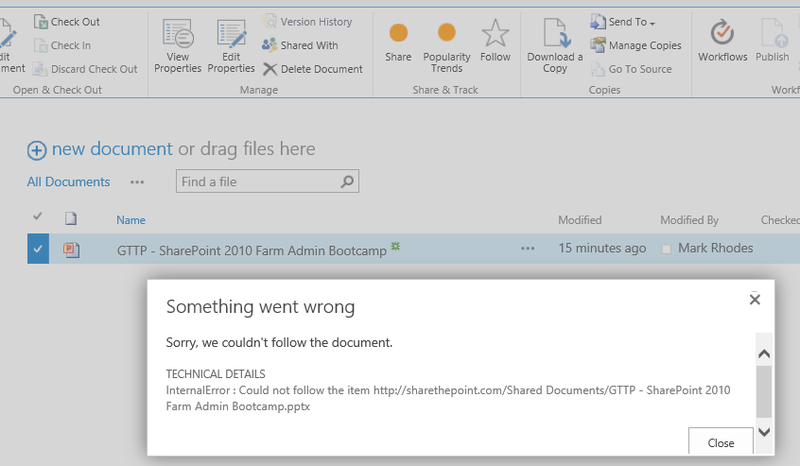 When attempting to follow documents in SharePoint 2013 Release Preview, I noticed the following issue. 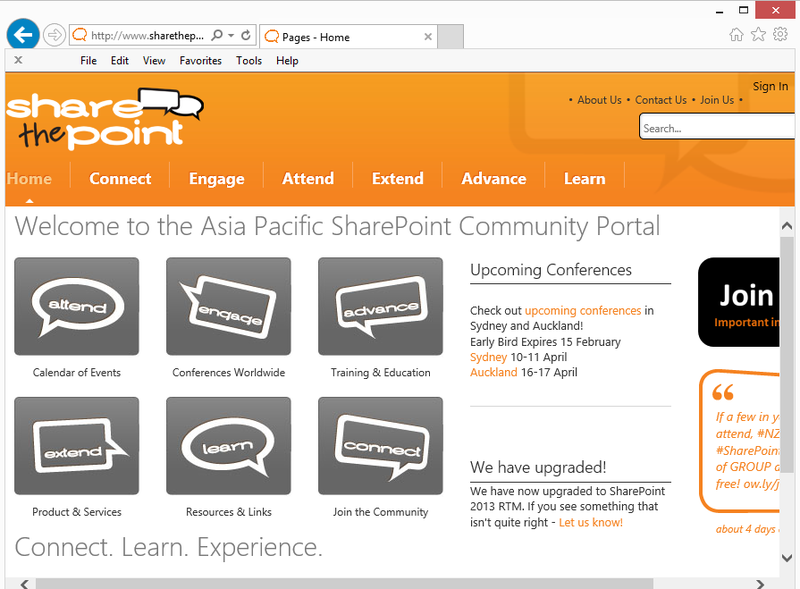 The new funcion of SharePoint 2013 “Follow” which will keep track of documents, sites, etc in a handy location in your MySite did not appear to be working. This was quite odd as it was working for documents in my MySite, but not when trying to follow documents outside of the MySite Web Application. The above screenshot shows the error that occurs when I clicked Follow, unfortunately these “Technical Details” are not as helpful as you would hope, so a quite trek into the ULS logs was in order. Cranking up ULSViewer, which works just fine with SharePoint 2013, I noticed the below error almost immediately. 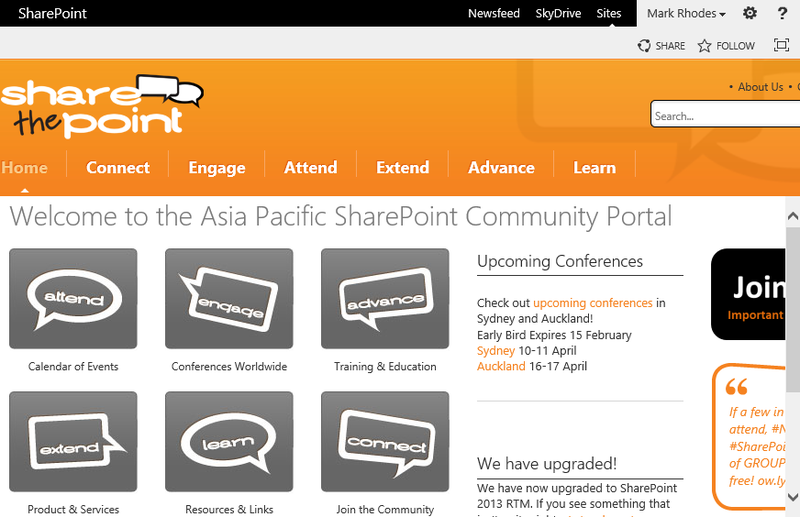 The way the follow function appears to work in SharePoint 2013 is a direct write back to your MySite Content Database. If you have your primary SharePoint 2013 site and your MySite on seperate Web Applications there is a fairly reasonable chance you have split them out so that they use seperate Application Pool Accounts, and in this situation obviously there is going to be a permission issue. All it takes to get this working is to make sure that the Web Application account has access to the MySite Content Database by giving it membership to the “SPDataAccess” role. And just like that, Follow is now working! As I mentioned in my last post, I’ve been spending time with SharePoint 2013 and once again have come across another little error regarding Farm Configuration. Cannot start service AppFabricCachingService on Computer “.”. As mentioned in my last post, there are some posts out there that suggest that you can circumvent Distributed Cache problems by Creating or Connecting to your configuration database with the –SkipRegisterAsDistributedCacheHost parameter, however this will result in the Distributed Cache Service Instance being absent from your farm, and I have at this stage been able to get it to reappear. As it is pretty early in the game for SharePoint 2013 I am not yet sure the impact that not having a Distributed Cache Service will have on your farm, however it will likely be negative. This particular problem seems to be permissions related as the Windows Service “AppFabric Caching Service” is unable to start when it is using the SharePoint 2013 Farm Account, and while I have not YET spent much time trying to figure out why this occurs, I was able to avoid the problem by adding my Farm account to the Local Administrators group. Hopefully this post will help a few folks avoid a rather frustrating problem. Note : Yes I am aware this is not best practice, however it may help a few folks get around the problem in what is likely to be a non-production test machine anyway as the software is still in Beta (Release Preview). I’ll be looking into this further to try and find out exactly what permissions are required so that we do not need to add to the local admin group. 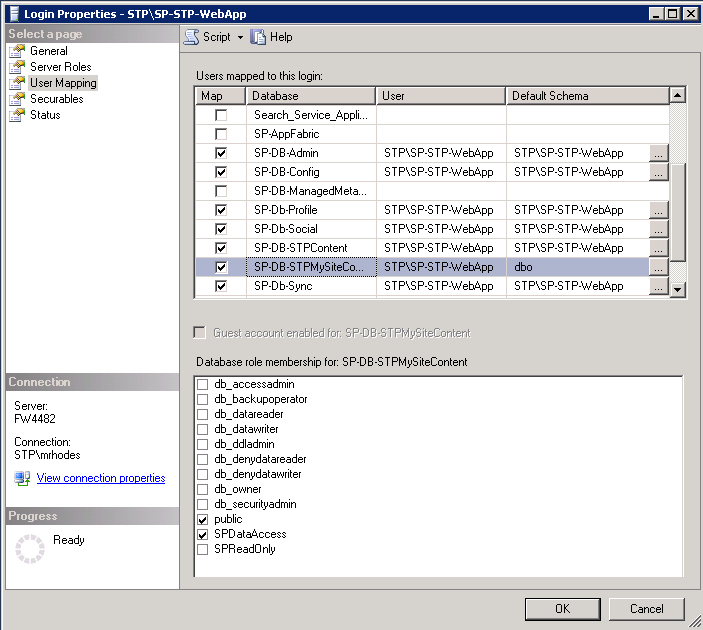 I’ve been spending a little bit of time around SharePoint 2013 and have been probing the various installation methods and came across this problem twice sp far while trying to configure SharePoint 2013 Farms. There are some posts out there that suggest that you can circumvent this problem by Creating or Connecting to your configuration database with the –SkipRegisterAsDistributedCacheHost parameter, however this will result in the Distributed Cache Service Instance being absent from your farm, and I have at this stage been able to get it to reappear. As it is pretty early in the game for SharePoint 2013 I am not yet sure the impact that not having a Distributed Cache Service will have on your farm, however it will likely be negative. What seems to be causing this particular problem is an alias being used for the SQL Server, when your SQL Server is on another server. Re-running the command or trying to establish your farm with the server name instead of the alias seems to avoid the problem. Hopefully this post will help a few folks avoid a frustrating problem. Note : This is not a solution, it is just a work around that might avoid frustrating and let you test out SharePoint 2013.